Career counselling appointments are at the core of how an institution’s career services can help their students find their true calling and start their career right. While we were writing this blog post, Anne, a Key Account Manager at JobTeaser, asked us to start by a reminder that you should always work with the tools that work best for you. In fact, not all career services will benefit from having dedicated software to manage career counselling appointments. For example, a small institution with few students and a small career services department may want to work with an open-door policy. It’s easier for students to come to your office when they need it, and if you can manage a few hours of open doors, you’ll fill them fairly easily. On the other hand, this can easily become unmanageable for larger institutions, with more students who need counselling. In that case, you will need a booking system that enables counsellors to focus on helping students, rather than doing menial work like managing their timetable and reminding students of upcoming meetings. As always when choosing software, the first thing to do is to check how well it integrates with other tools you use. For example, make sure that your booking system works seamlessly with your student database, so you can prepare for the meeting with all the necessary information about the student directly into the appointment details. The fewer different tools you use, the easier your work will be. Once you’ve checked integrations, have a look at the back-office of the booking system. Can you delete a meeting in one click? Can you store meeting rooms names? Does the system send automated notifications to both you and the student? Again, the goal of this is to have a system that is as automated as possible to save you time and effort and let you focus on what matters most: your students. Software must make reporting easy. Compare the different reports that your benchmarked tools can create: some of them will be more intuitive, others more complete, other yet might enable you to report on more relevant performance indicators. Choose the reports that work for you. This is a classic of choosing the right outsourced tool: choose a partner or provider that will adapt to your needs and listen to your requests. A tailor-made platform and a generic product with frequent updates both have their pros and cons – a provider that doesn’t listen to your improvement requests only has cons. The point isn’t to have a partner that does everything you ask them, as they have technical limitations like everyone else, but to make sure they often improve your platform. With the General Data Protection Regulation coming in full effect on May 25th, it’s important to check that if you choose an outsourced platform, it should be GDPR-compliant. Review contracts carefully and don’t be afraid to ask the question to partners so you don’t take any risks: security should be a key priority for them and for you. In order to have more students book career counselling meetings, you need to make sure that the act of booking a meeting is as simple as possible. We advise never making students click more than 3 times on the software to do any action, including booking. This means that you will need a clear overview page, with easy access to your dashboard directly from the institution’s intranet welcome page. 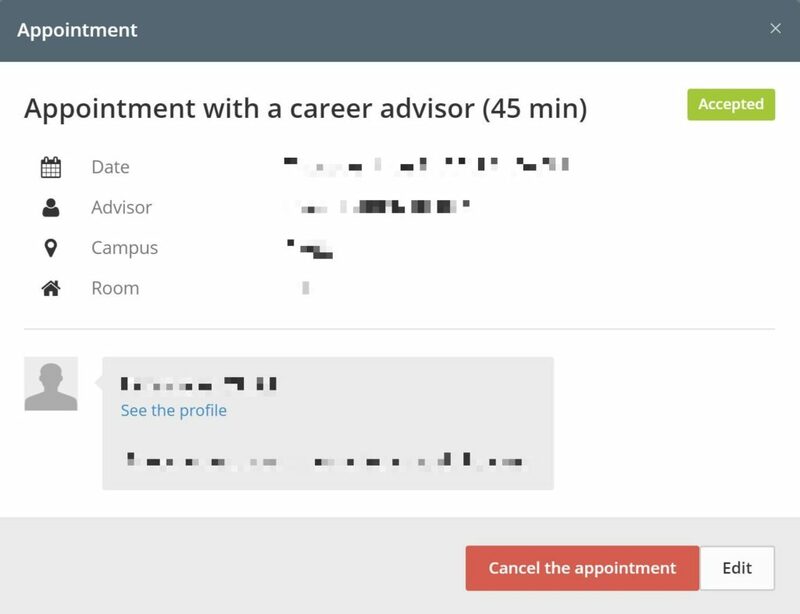 For example, on the Career Center by JobTeaser, the appointment module is directly in the main menu. This way, students can make an easy transition from job offers to the advice section, on through the booking module once they have all the general information they need. Having everything in one tool, such as career counselling appointment bookings, event announcements and registrations, and job listings for an ideal student experience. On your overview page, make sure that the software you choose lets you introduce your career counsellors at first glance. By “introduce”, we don’t mean just a name and a programme: students should be able to see a picture and a biography outlining the broad steps of your counsellors’ past career. This way, students can relate to someone and book a meeting directly with them. When a student books a meeting, let them book different kinds of meetings, and explain how they work: we’ve talked about it recently in our blog post on how to increase your number of career counselling appointments. If your software enables students to book a meeting, but not choose from a list of meeting types, two issues will arise. First, you will have fewer students ready to talk to you because they don’t know what to expect. Moreover, you will have a hard time yourself, because you won’t be able to set expectations prior to the meeting and to prepare accordingly for each student’s needs. After booking an appointment, there are still a number of reasons why your students can stand you up on the day of the meeting. We’ve talked about how to avoid no-shows at career counselling appointments, and identified three main reasons why a student can’t make it to an appointment. Two features can solve all three issues. The first one is one that we’ve already mentioned above: automated reminders. People can forget an appointment, especially students who may have a rather chaotic calendar. By sending them an email automatically a few days or hours before the appointment, you will drastically increase the number of students who attend the meeting. The second one is making sure that your system includes a simple way to cancel an appointment on the student side, so that they don’t take a timeslot and then keep it, although they know they won’t be able to make it, thereby wasting your time and damaging the trust you may have in them. A line stating “if you can’t make the appointment, please send an email to X” will do the trick, but for a more student-friendly experience, get a booking system with integrated cancellation options. If using software is the right solution for your career counselling efforts, then make sure that it is easy for you to use (through integrations and automation) as well as for the students (with easy bookings and cancellations, as well as reminders).